For the last decade, the number of horse welfare cases has increased significantly, as horse overpopulation becomes a growing concern in this country. Too many horses are being bred which means, with fewer people now able to afford them, many are being neglected, fly-grazed, or passed over to charities. Because of this, huge pressure is being placed on rescue centres and sanctuaries across the UK, which are struggling to cope with the volume of unwanted horses. Unfortunately, if this trend continues, it is likely that a large number of healthy animals will be euthanised because there is nowhere else for them to go. Irresponsible dealers are to blame for the problem, by indiscriminately continuing to breed and sell, despite market saturation meaning that the price of horses has plummeted. Some sources indicate that horses and ponies can be acquired for as little as £5 at auction, while others are offered up just as cheaply and yet remain unsold. This goes to show just how many unwanted horses there are. The poor economic climate hasn’t aided the situation either, as fewer people can afford the weekly expenditure (approx. 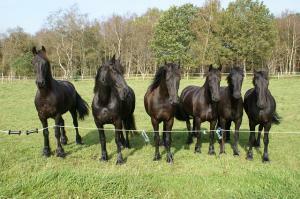 £100) required to care for a horse, which takes into account feed, shelter, routine care and veterinary costs. Also, because the equine market has become saturated in recent years, many horses are of poor stock, meaning they have very little sale value. This has resulted in many being sold cheaply to the meat trade and exported across Europe. If charities won’t agree to take them and they aren’t sold to abattoirs, most unwanted horses are left to fend for themselves on private land (reserved for livestock), or are being let loose for the authorities to deal with. While the trend is also apparent for cats and dogs, the horse overpopulation crisis is more extreme. To try and tackle the problem, the British Horse Society (BHS) is proposing to hold ‘castration clinics’ in the autumn of 2015 and spring of 2016 in a bid to reduce the number of horses being bred. The clinics will be held at least once in every region and nation that the BHS operates. Castration won’t be free to everyone, but it will be subsidised to those who are struggling to pay for the procedure themselves. Boarding a horse in a rescue costs the taxpayer money (roughly £8 a day), which the BHS suggest could be better spent on clinics for castrating horses. Horses brought to the clinics won’t just be castrated either – they will also be given a health check by a trained vet, as well as advice and support on a range of issues offered to their owners. Not only is the BHS’s proposal financially beneficial, it will prevent a lot of suffering to potential future foals. How many unwanted foals will this prevent? It’s impossible to say, but in a few generations it is easy to see how the number could well be into the thousands." Today, it is thought there are roughly one million horses in the UK, most of which are privately owned leisure horses. This means that breeding is largely unregulated and this is particularly evident in the travelling community. The unrestricted breeding of their horses results in unwanted foals that then cannot be cared for. This is when fly-grazing becomes an issue. Surplus stock, decreased demand and therefore decreased value has meant that many horses are at the mercy of irresponsible owners who will happily abandon them to the care of others. Because there are limited resources for catching offenders and because most fly-grazing takes place after dark when horses can be transferred to private fields unobserved, policing the activity is difficult. A new bill in Wales (The Control of Horses Act 2014) means that local authorities, police and animal welfare charities will maintain the right to seize, sell, re-home and humanely euthanise (as a last resort) any horse that trespasses private land without consent of the landowner. This removes the problem of rogue horses over-grazing the land and clearing fields of grasslands and pasture destined for the landowner's livestock. It also reduces the risk of harm coming to the farmer or landowner from animals that are unruly, distressed or unwell, as well as the likelihood of over-breeding. If overpopulation is a problem then culling might be an issue or simply give them to the supermarkets for meat as lots of people didn't mind eating them last time. This way, at least we are recycling as horrific as it sounds. Many cultures have no problem eating horse so about time we rethought about our misgivings too. My wife has just had her horse of 22 put down due to a major heart complaint. How would I contact horse re-homing centre, with a wiew to finding a replacement. We live in rural Hereforshire, and have 2 other horses, and have looked after horses for over 40 years. The problem is just that, those that do not care do not care if their horses breed resulting in poor quality inbred horses and those that do care have stopped breeding meaning that in a few generations there will be a shortage of good horses and a glut of poor horses. Just exactly the same as puppies. Bring back stallion licences, and any stallion without a licence should be able to be removed and castrated. Costly I know but as you say how many offspring can one stallion produce. I have 2 stallions and would happily licence even though they are not being used to breed currently. Same with male dogs the responsible owners either castrate or take good care no to breed and the unresponsible just let anything happen so they can make money so they would never come forward for even subsidised neutering. I agree that we need strict control over the breeding of equines and of all domestic pets as the numbers of unwanted animals are escalating. Charities and rescue centres cannot help them all. Legislation is badly needed to stop puppy farming. People should not be allowed to profit from cruelty to animals. The Control of Horses Act sounds like a step in the right direction. Scotland and England take note! If horses do have to be culled it is important that they are slaughtered here in the UK. No live animal should be subjected to the horror of a long journey to the continent. The meat can be exported if there is no market for it here.